This past weekend was absolutely wonderful! 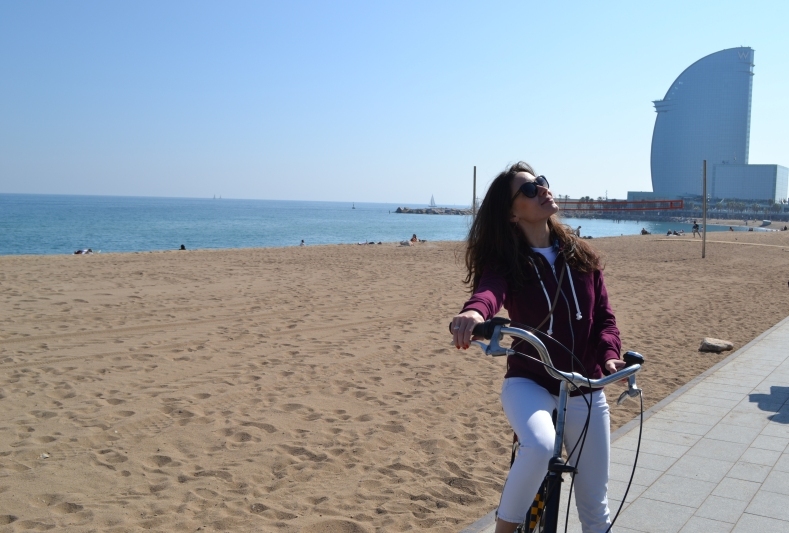 I have spent it in sunny Barcelona, truly enjoying my first warming sun rays of this year! Aahhh… what a magical feeling it was, walking around, the sun stroking my face, enjoying the crisp blue sky, and feeling the cool breeze by the beach! I felt extremely grateful for all the blessings in my life. The sun made me feel super energized, I could not stop smiling and my mood was elevated. It seems the sun has a similar effect on all of us, doesn’t it? Does the sun make us happier? There is quite some evidence that the sun really can play a major role in our emotional state. Sunshine affects the brain via the interaction of the chemicals melatonin and serotonin. When sunlight hits your eyes, your optic nerve sends a message to the gland in the brain that produces melatonin (a hormone that helps you sleep); the gland decreases the secretions of melatonin, and as a result you feel more awake. The opposite happens with the chemical serotonin (a hormone that maintains a “happy feeling” and wakefulness); when you’re exposed to sun, your brain increases serotonin production. Your mood is sometimes related to micronutrients. And there is one vitamin that influences your mood, and you can get it directly from the sun! Drum roll please…Vitamin D.
Vitamin D plays an important role in your body. It maintains blood calcium levels and makes sure there is enough calcium and phosphorus present for building bones and teeth. It protects you from pre-mature aging, helps regulate hormones and can prevent many forms of diseases such as cancer, heart disease, osteoporosis, and many others. How often do you actually get to be in the sun? If you live in northern Europe, like me, you probably do not see the sun that often. Most of us go from our homes to our offices and back by car. We are rarely directly exposed to sunlight, and a lot of us are actually afraid of direct sunlight exposure (skin cancer, wrinkles). Yet sun exposure to the skin is the most natural and effective way to get our vitamin D! So it should not surprise you if I tell you that you are likely deficient in vitamin D.
How to make sure you are getting enough vitamin D? If you suspect you’re not getting enough vitamin D, your doctor can give you a simple blood test. He can also prescribe you some supplements. Just make sure you use pure vitamin D3 capsules, encapsulated in olive oil, rice bran oil or fish oil, that are free from artificial ingredients and colorants. The Recommended Daily Allowance (RDA) in Europe is 5 µg. Be careful when supplementing as over-supplementation can lead to toxicity. Vitamin D2 is used to fortify some foods (like in milk) but it does not metabolize as well in the body as D3. We can also eat some of our vitamin D, by consuming egg yolks, and fish liver oils. Sunlight is the best and only natural source to get your vitamin D! Unlike dietary or supplementary vitamin D, when you get your ‘D’ from sunshine your body takes what it needs, and de-metabolizes any extra. It takes only 20 minutes of sun exposure for the body to make 20.000 IU (international units) of vitamin D. Sun screen can inhibit the effective production of vitamin D, so once you have soaked up your D dose, make sure you protect your skin if you plan on staying in the sun for longer than 20 minutes.